Published on December 14, 2018 in Lake Winnipesaukee Hotel. Closed Tags: Lake Winnipesaukee Hotel, ski and stay getaway, ski areas in new hampshire. As the lake begins to freeze over right before our eyes, we are thrilled to jump into some winter sports and activities! Soon enough visitors will be out ice skating, snowshoeing and snowmobiling just beyond our very own beachfront. While waiting for the ice to thicken, guests are welcome to take advantage of other great snow sports in the area with hugely discounted skiing and snowboarding tickets from our partner ski areas: Gunstock, Waterville Valley and Loon Mountain. Gunstock Mountain, located in the neighboring town of Gilford, is a short 30-minute drive away. Guests taking advantage of our Gunstock Ski and Stay package enjoy 20% off the accommodations of their choice and 25% off tickets to Gunstock which can be used for downhill skiing, snowboarding, tubing, or cross-country skiing. One of the closest large ski mountains near Boston, you can appreciate the beauty of Gunstock’s panoramic views of Lake Winnipesaukee and the surrounding Belknap Mountain range from the summit. Once you finish your runs at the mountain, make your way back to the Inn and into our four-season outdoor hot tub, while enjoying a nice hot cup of coffee locally roasted by Wayfarer Coffee Roasters. You cannot go wrong choosing us for your Gunstock Lodging. If you are planning to head a bit further north into the White Mountain National Forest, there are two more excellent ski areas that we offer discounts for. 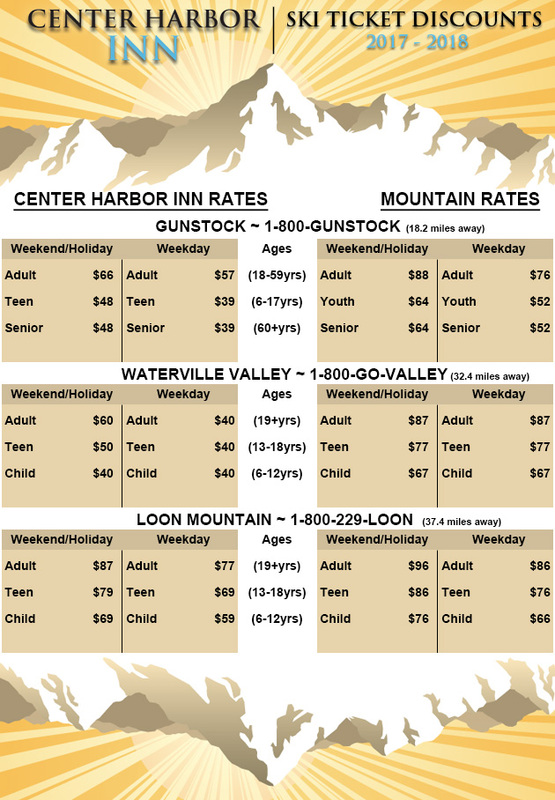 Located 45 minutes away in Lincoln, New Hampshire, Loon Mountain is a perfect choice for riders of any age and skill level. Keep an eye on their website for exciting upcoming events at the mountain! Last on our list is Waterville Valley. Waterville is a quaint town tucked away in the national forest known for skiing. This pristine New Hampshire mountain attracts many winter sporting enthusiasts. Be sure to check out their extensive cross country trail network in addition to their 62 alpine trails. After as many trips down the mountain as you can handle, come back to the Inn to enjoy some stargazing from your personal balcony and relish in the comfort of your king or queen sized bed before retiring for the night. Get a great night’s rest and in the morning head down to the front office and check out all of our ski discounts while enjoying our continental breakfast to get you fueled up for another amazing day on the slopes. Published on February 1, 2018 in Lake Winnipesaukee Hotel. Closed Tags: Lake Winnipesaukee Hotel, ski and stay getaway, ski areas in new hampshire. Located directly on the shores of Lake Winnipesaukee, enjoy the full experience of Winter in the Lakes Region at the Center Harbor Inn, where we are close in proximity to great ski areas in New Hampshire. 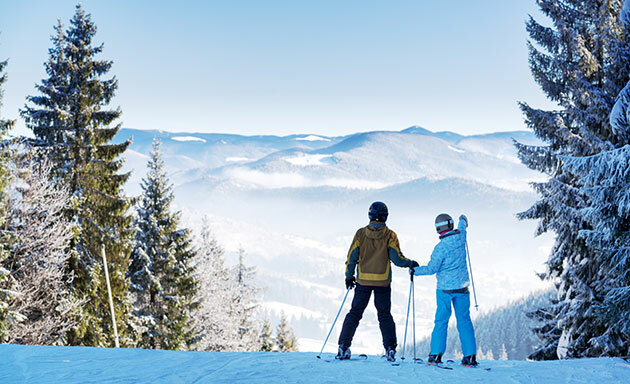 Enjoy discounted ski tickets to Gunstock Mountain, Loon Mountain, and Waterville Valley. Wake up in the morning from the comfort of your room and look out the windows on your private balcony to beautiful views over frozen Lake Winnipesaukee. Head down to our continental breakfast room and start your morning off with a locally sourced continental breakfast including bagels and coffee before heading out for a day on the slopes. For a ski mountain close by, head to Gunstock Mountain in Gilford, where you can take on the slopes with breathtaking views overlooking Lake Winnipesaukee. With 55 trails snowboarders and skiers can ride at any level. Make the most out of your trip and take advantage of our ski and stay package with 20% off accommodations and 25% off ski tickets to Gunstock Mountain each night of your stay. 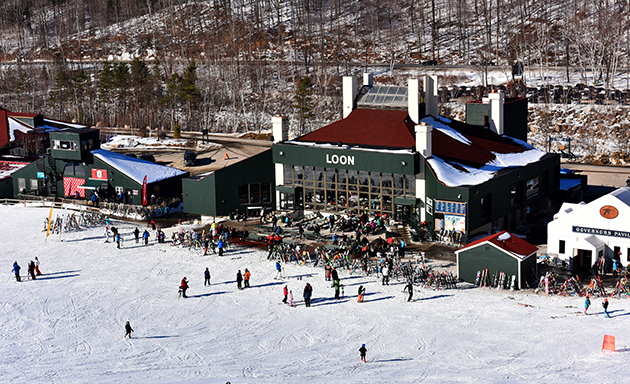 If you are looking to head into the White Mountains, Loon Mountain is a great option. Located in Lincoln, NH the mountain offers over 60 trails with a variety of terrain to match your ski or snowboard level. The mountain has a total of three peaks, South Peak, The North Peak, and Loon Peak with each catering to something different whether it be a terrain park, backcountry or typical New England skiing. Take the gondola up and enjoy beautiful views of Franconia Notch and Mt. Washington. Waterville Valley is a beautiful ski town and has over 265 acres of terrain. Deep in the White Mountains of New Hampshire you can ski as a beginner, intermediate, or expert and never get bored. After a long day on the mountains head back to the Center Harbor Inn and head out to our four-season outdoor hot tub with heated walkways to relax and warm up. Enjoy a great night of sleep in one of our king or queen beds, wake up, and hit the slopes again!